The five-seat Harrier SUV from Tata is available in India at a starting price of Rs 12.69 lakh. Tata’s much-awaited SUV, the Harrier, has officially been launched in India at a starting price of Rs 12.69 lakh. The five-seat SUV is powered by Tata’s turbocharged 2.0-litre Kryotec diesel engine, which churns out 140 horsepower. The engine is mated to a six-speed manual gearbox. Tata announced the launch of its new SUV on its official Twitter account. Though bookings for the car have been open for some time now, deliveries are scheduled to start later in January. A quick look at the spec sheet tells us that Tata’s new SUV comes loaded with safety tech. The Harrier’s Electronic Stability Program (ESP) has fourteen additional features, such as Roll Over Mitigation, Electronic Brake Pre-Fill, Dynamic Wheel Torque by Brake, Corner Stability Control, and Brake Disc Wiping, apart from standard features like Anti-lock Braking System, Hill Hold Control, Electronic Traction Control, and Electronic Stability Control. In addition, the rear seats have ISOFIX anchor points for child seats. “Built on the OMEGA ARC, which is derived from Land Rover’s legendary D8 Platform, the Harrier is a testament of our continued efforts to deliver global products. 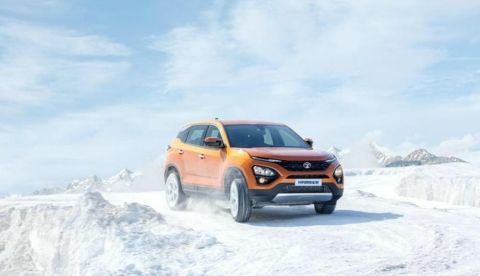 With this product, Tata Motors has rightfully entered the premium mid-size SUV segment,” said Mayank Pareek, President of the Passenger Vehicle Business unit at Tata Motors. The Tata Harrier sports selectable terrain response modes (Normal, Rough, Wet) and engine drive modes (Eco, City, Sport). The ‘Floating Island’ infotainment on the centre console of the Tata Harrier includes an 8.8-inch touchscreen display with support for Android Auto and Apple CarPlay. Tata also offers ConnectNext, a suite of smartphone apps like DriveNext and Tata Smart Remote, to connect with the car remotely. Audio is taken care of by a 320W JBL audio system, which consists of nine speakers—four mid-range speakers, four tweeters, and a subwoofer). Additionally, the Tata Harrier gets a 7-inch colour TFT display in the instrument cluster. The Tata Harrier is available in four variants: XE, XM, XT, and XZ. Colour options include Calisto Copper, Thermisto Gold, Ariel Silver, Telesto Grey and Orcus White.